Catholics' hunger for the faith continues to grow. Pope Benedict XVI gives the Church the food that it seeks in the 598 questions and answers in the Compendium of the Catechism of the Catholic Church. This 200-page volume offers a quick synopsis of the essential contents of the faith as promulgated in the Catechism of the Catholic Church. Like the 1992 Catechism, the Compendium has a four-part structure, and includes a section on common prayers and Catholic doctrinal formulas. Because of the question-and-answer format, catechetical leaders-parents, pastors, teachers, principals, and catechists-have a unique opportunity to dialogue with the faithful, and reinvigorate the Church's ongoing mission of evangelization and catechesis. Individuals can come to know the unfathomable riches of the salvific mystery of Jesus Christ by reading, using, and memorizing parts of the Compendium of the Catechism. An essential tool for youth and young adults, the Compendium is the perfect companion to a youth or young adult's Bible, spiritual reading, or textbook. Catechetical leaders in high schools, colleges, and parishes will appreciate its versatility-as a reference book, discussion starter, or core resource for RCIA programs. Fourteen images taken from masterpieces of Christian art set a tone for each part or section. The sacred images, with their beauty, are also a proclamation of the Gospel and express the splendor of the Catholic truth, explained Pope Benedict XVI. The Compendium of the Catechism was prepared by a commission presided by the then Cardinal Joseph Ratzinger. 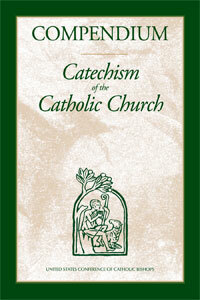 Following the request for greater appreciation of the Catechism, and in order to meet a widespread need that emerged during the 2002 International Catechetical Congress, in 2003 the Holy Father established a special commission, presided by the prefect of the Congregation for the Doctrine of the Faith, that he charged with preparing a Compendium of the Catechism of the Catholic Church, containing a more concise and dialogic version of the same contents of Catholic faith and morals.